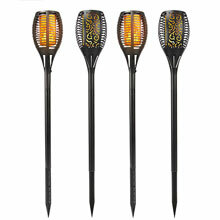 Each of these solar flame light torches are made of 56 warm yellow LED lights, causing them to look like flickering natural flames in the air. 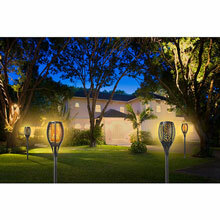 The solar flame torch absorbs the sunlight all day and they will automatically turns on at dusk, casting a soft and pleasant light on its surroundings. With durable plastic spike, you can stick your torch light into anywhere you like with no wiring needed, and enjoy the warm flickering light. Set of 4. 5" diameter, 24" high. 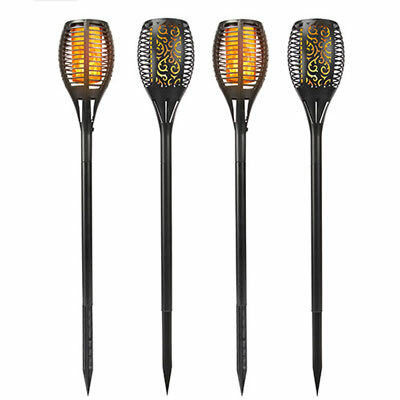 •GORGEOUS DANCING FLAMES DESIGN: These torches lights truly prove to be a very safe alternative to the real flames as they don't actually carry real fire. 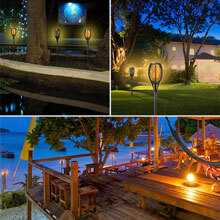 It is actually made with LEDs that cast a rather soft, mood-enhancing, pleasant glow. These lights use unique optical controlled technology, which helps to create the illusion of dancing frames. 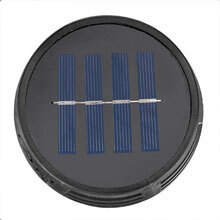 •ECO FRIENDLY: They never needs batteries, rather, they uses solar energy to charge themselves. The torches collects solar energy all day, and then automatically turns on at dusk, casting a soft and pleasant light on its surroundings. 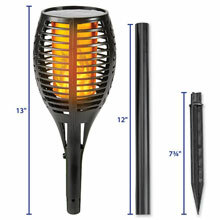 •DURABLE MATERIALS: These LED torches, unlike real fire torches are not affected by the weather. The durable waterproof plastic casing is design to withstand all kinds of weather all year round. 5" diameter, 24" high. 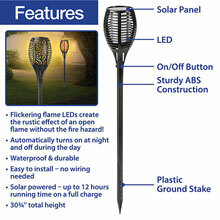 •EASY INSTALLATION: No wiring required, simply install solar flame lights stakes in the ground where you like, then enjoying the torch light yourself and greeting guests with warm and welcome glow. 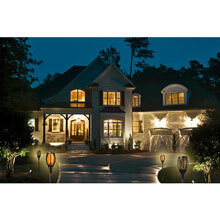 •AUTO ON/OFF FROM DUSK TO DAWN: Solar lights with daylight sensor, auto solar power charging all day, then turn on the bulb automatically at dusk and turn it off when it's dawn.